Tzatziki, pronounced dza-DZEE-kee – also spelt tsaztiki, I know… it’s a bit of a tongue twister. But this yoghurt based sauce or dip, is another one of the traditional greek recipes which is really delicious. Popular in restaurants, greek snack bars and it's one of many easy greek recipes we make regularly at home in Cyprus. It is a very versatile greek yoghurt sauce. Served as a greek appetizer, with warm pita bread. Regularly served as a side dish to a greek meze, with kebabs such as pork, chicken or beef souvlaki. We love making this authentic greek yoghurt recipe, it is so easy and very yummy! My family will eat tzatziki with almost anything. If your health conscious, like we are, it’s a very healthy recipe to have with almost anything. I love it with a greek salad and grilled chicken or jacket potato and tuna. Leave it on the table during almost any meal and I guarantee you and your family will be dipping just about anything in it..
Once you try this greek sauce recipe, you will make it on a regular basis. Yoghurt Fat free, low fat or full fat Greek Yogurt, are fine. No matter which greek yoghurt you use the taste is still good. Obviously the more fat content the yoghurt has the creamier the taste. But the more calories your adding to it. The garlic and herbs are enough to flavour the yoghurt without the higher fat content. 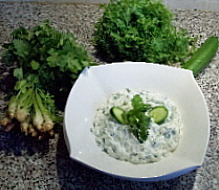 Tsatziki contains cucumber. Cyprus cucumbers are about the same size as a courgette and do not contain as much water as some other cucumbers. If your using a large cucumber, available in the UK or imported from somewhere else they may be very wet inside. Slice the cucumber length wise, scoop out all the seeds and drain the cucumber for about 30 minutes. Place it on some kitchen towel inner flesh side down to drain the moisture. In a small dish, whisk the olive oil and lemon juice together. Add the greek yoghurt to a medium bowl. Gradually add the olive oil and lemon juice mixture to the yoghurt. Mix really well to incorporate the oil and lemon mixture to the yoghurt. Chop the cucumber into small pieces, remember to drain moisture first. Roughly chop the cucumber, parsley and coriander. Mince in a blender. Add the cucumber and herbs to the greek yoghurt mixture, mix well until it's evenly distributed. Garnish with a little flat leaf parsley or coriander. Warm pitta bread cut into quarters, chop fresh vegetables - dip till your hearts content. Jacket potato with tuna, cucumber and spring onion. Spread tzatziki inside a pitta bread before filling with souvlaki chicken kebab or another favourite greek recipe of mine is home made burgers - Yummy! Experiment with different herbs and spices. Some people like to use dill in place of parsley and coriander. If you like a little spice in your dips, add some turmeric, mild curry powder and mango chutney – its really nice with Indian curry. Or try adding fresh mint instead. Variety is the spice of life. Add daily! Fresh Tsatziki can be stored in the fridge for several days. I cover mine with foil. If you have a favourite recipe, please share it with us and other site visitors, don't be shy. Just write it below, I can't wait to read it!